My grandmother, Emmeline Blanche PAINE, was born 13 October 1865 at 69 Globe Road, Mile End Old Town, in the East End of London. On 9 July 1883, before her 18th birthday, she married, at St. Botolph’s, Aldgate, Andrew Sellar JEHU, incurring the anger of her father Samuel PAINE, who had forbidden her to continue to meet Andrew. Her father had refused her return to the home; which is why Emmeline stated on her marriage certificate that her father was 'deceased' when he was still very much alive. Andrew proved to be a chronically unfaithful husband; consequently, about 1900 and after having borne six children, she left her home & family and went on the stage. Although she never attained any prominence, she was (- I have been told -) quite a competent actress. She acted under the stage-name of 'Barbara STEELE’; and, when 'resting', used the name 'Mrs HUNTER'. She first played in George Edwardes' musical comedies, and toured with the 'Silver Slipper' show in 1901/3. Shortly afterwards, she was in 'Julius Caesar' at the Haymarket Theatre, in London. In 1909, she inherited a small legacy from her mother and started her own concert party' (which she called 'La Scala’) at Troon, Scotland. I have seen photographs of this group, and it is what was later called a ‘pierrot show'. After a few years, her manager absconded with all her money; and thereafter she toured with repertory companies. During the 1920s, she played in 'The Best People', 'The Rotters' and 'Tons of Money' (in which she took the part of Miss Benita Mullet). Her last stage appearance was in 1934, at the age of 68, as the Dancing Mistress in 'Children in Uniform'. During the 1930s, I occasionally visited her in her theatrical 'digs' in Mornington Crescent, North London, and at 62 Crowndale Road, London NW1, where she was living in 1938. Quite often, her eldest child, my aunt Edith (SHAW) was living with her; and it is from my aunt that I obtained these sparse details of my grandmother's stage career. Early in 1939, Edith persuaded her parents to live again under the same roof, though they did not live together. My grandfather moved to 23 Acris Street, Wandsworth, where he occupied the ground floor. My grandmother lived on the first floor, as his tenant; and my aunt Edith, and her niece (my cousin) Eileen, each had rooms on the second floor. I visited this extraordinary household, with my parents, a few months before the outbreak of World War II; and that was the last time that I saw my grandparents - he standing in the hall, and she at the top of the stairs - both simultaneously saying 'Goodbye' to us, but neither speaking to the other. Shortly after War broke out, the household was evacuated to 25 King's Road, Henley-on-Thames, where both my grandparents died. The Wandsworth house was later completely destroyed in the 'Blitz’. My grandfather died 8 November 1940 aged 82 years, and my grandmother died 17 April 1942 aged 76 years. 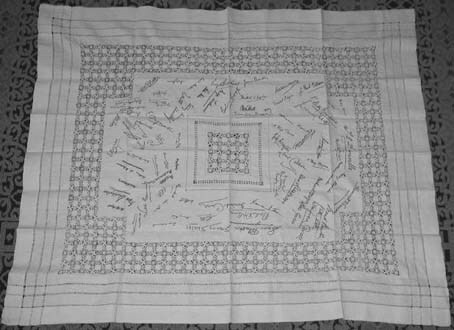 During the long idle hours of her stage life, my grandmother embroidered this linen tablecloth, on which she collected the autographs of 81 people connected with the stage, and with each of whom she was, at some time & in some way, connected. The autographs are listed below, alphabetically, [see inscription] & numbered 1-51.A because I omitted one name in the original listing. In order to locate the signature on the cloth (-and vice versa, to identify a name on the cloth -), 1 made in 1948 a Key showing the cloth divided into XII clockwise segments.